This morning, Square-Enix has announced something special for fans anticipating the release of Kingdom Hearts: Dream Drop Distance. The publisher is preparing a “Mark of Mastery Edition” of the game. What’s included in this special collector’s item? 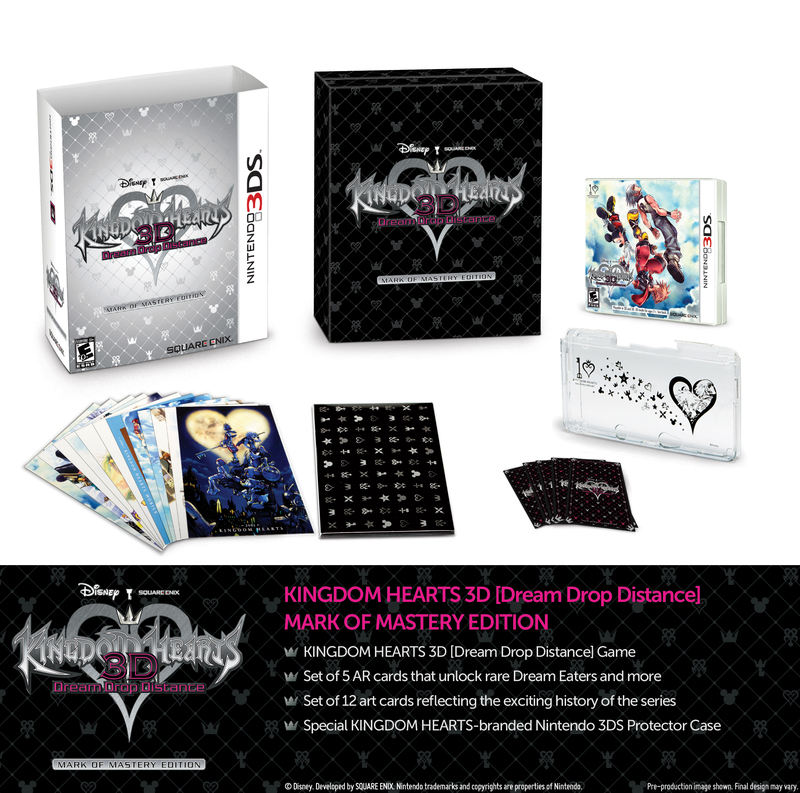 The “Mark of Mastery Edition” includes a copy of the game, a Kingdom Hearts 3D hard case to protect your 3DS, 12 cards with art from the series, and five Augmented Reality cards that unlock rare Dream Eaters for use while playing the game. Everything is included in a special collector’s box. According to the Press Release featured at the bottom of this article, this is the first time a Kingdom Hearts Collector’s Edition has been released in North America. The “Mark of Mastery” Edition can be purchased for $54.99, which is fifteen dollars more than the regular retail price of the game. LOS ANGELES (May 16, 2012) – Square Enix, Inc., the publisher of SQUARE ENIX® interactive entertainment products in the Americas, today announced the Mark of Mastery Edition for the North American launch of KINGDOM HEARTS 3D [Dream Drop Distance]. Scheduled for release on July 31 for the Nintendo 3DS™ system, the box set will be available for $54.99. The series’ first collector’s edition for the North American market is housed in a KINGDOM HEARTS-branded magnetic box. It will include a copy of KINGDOM HEARTS 3D [Dream Drop Distance], a branded clear hard case skin cover and 12 art cards. It also contains five augmented reality (AR) cards that allow players to unlock rare Dream Eaters such as Meowjesty, Frootz Cat and Kab Kannon, and a 360° viewing stand that allows players to take a closer look at their Dream Eaters from all angles. The Mark of Mastery Edition is an excellent opportunity for fans to commemorate the groundbreaking franchise’s 10th anniversary. In preparation for an impending threat, Sora and Riku enter the Sleeping Worlds to complete the Mark of Mastery exam. They will encounter new enemies and make new friends in worlds they have never set foot in, and if successful in their quest, they will become true Keyblade Masters. With brand-new gameplay features, worlds and creatures, KINGDOM HEARTS 3D [Dream Drop Distance] continues the tradition of engaging entertainment.